THE ARTCO TRAINERS WORK IN A PERSON CENTRED WAY MEANING THEY WILL SUPPORT YOU TO DEVELOP AT YOUR OWN PACE AND IN ACCORDANCE WITH YOUR ABILITIES AND GOALS. The Art Studio is based at the Level Best ArtCafe. While working in the Art studio you will have the opportunity to learn about and use a number of techniques such as printing, canvas painting, collage, textiles (e.g.knitting), mosaics, drawing, 3D construction (e.g. papier mache) and digital media. As an ArtCo trainee you would be involved in the running of our art gallery. This will mean meeting exhibiting artists, hanging and labelling new exhibitions, photographing and promoting exhibitions through posters and leaflets and marketing the exhibitions on our blog, website and facebook page. Providing a good atmosphere in the art department is really important to us. We create a space where people can take their time and concentrate quietly. 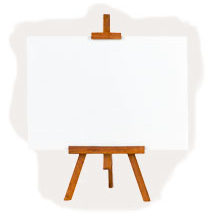 We provide the tools such as blank canvases, acrylic paint, and brushes and let the energy flow.